@Natanji Are you sure, that you deleted the old Beta or Alpha before installing DAVdroid rc1? @devvv4ever I first updated it, but then the app force-closed on start and I noticed that you said we had to reinstall. So I uninstalled it, which does remove all data, and then reinstalled. Alas, no account was present before, and only upon entering my account data and opening the account’s settings, I did see the double entries. So yes: I’m sure. Okay, great! What Horde version do you have? Can you provide a test account for us? Another important information is found in the Debug info (also found in the general DAVdroid Settings). Please send it too, you can directly share it from the view dialog. @Natanji Is is possible that the duplicate entries come from shared address books? I can’t reproduce that behaviour with our Horde test installation. add it again? Then it should work. @devvv4ever I tried your suggestion of removing+rebooting+readding, but that didn’t fix it. It’s not my own server so providing a test account is not possible for me (I could only give you the contact info of the server admin, if all other debug info doesn’t help - I’m pretty sure he uses DAVdroid and likes it ^^). It’s Horde version 5.2.10. @rfc2822 No, it’s definitely my own address books. 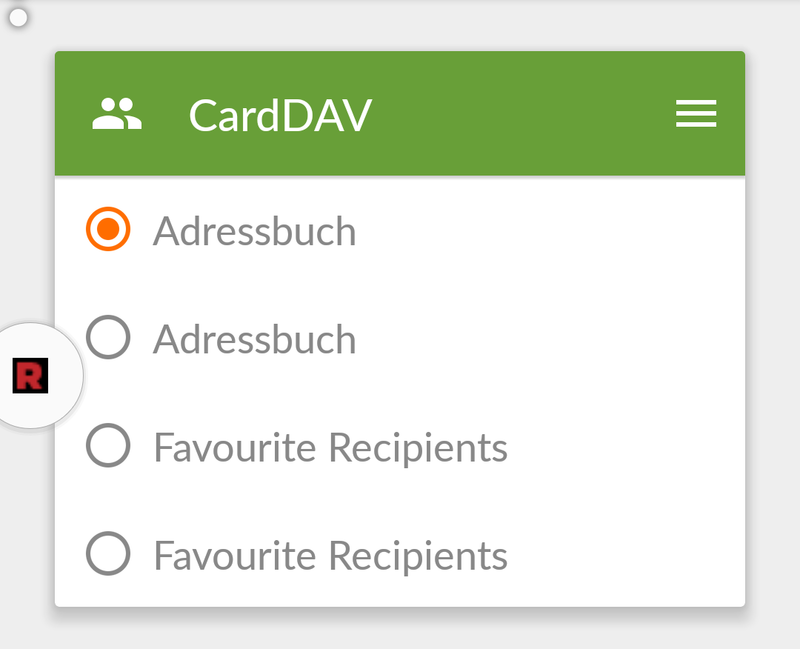 If I rename my “Adressbuch” to something else and refresh the list, it will appear double with the new name. As to see from the logs, Horde says that you are a member in the group https://org.myserver.de/rpc.php/principals/-system-. DAVdroid checks group principals for address books too (for instance, you might be member of your team’s group, which owns a shared address book for the whole team). According to Horde, this -system- group has an address book home-set (= owns address books) at https://org.myserver.de/rpc.php/addressbooks/-system-/. So, if this is not intended behavior (I guess it’s not), then it’s a Horde bug, because the -system- group shouldn’t mirror your personal address books with other URLs. This is indeed strange. Especially because with beta1 I didn’t have this problem - the address books only appeared once. I’m really not sure what is causing this behaviour. It’s not like it’s a big deal either, just cosmetically… unsound. This is indeed strange. Especially because with beta1 I didn’t have this problem - the address books only appeared once. Beta1 didn’t query member groups (correctly). I’m really not sure what is causing this behaviour. It’s not like it’s a big deal either, just cosmetically… unsound. For further discussion, I’d move to the Horde community, as this is a Horde problem (in case it’s not a feature). *did someone write a bug report to the Horde framework? As far as I know: no. Would be cool if you’d do that (and provide this thread for reference). Synchronizing the wrong address book (the one that belongs to -system-) might not work. When synchronizing the correct address book, there should be no problems.